Measles among diseases highlighted in the book VACCINE SCIENCE REVISITED: Are Childhood Immunizations As Safe As Claimed? As a measles outbreak dominates headlines in the US and a state of emergency (over measles) has been declared Washington, it’s timely to draw attention to a chapter devoted to this infectious viral disease in our new release book VACCINE SCIENCE REVISITED. Measles, mumps and rubella viruses cause acute infections that are dependent on humans for survival and replication. Measles virus has the ability to suppress the immune system and it’s common to get secondary infections like ear infection. These secondary infections are usually treated successfully with antibiotics. As with measles, the mumps virus is one of those viruses best contracted during childhood. When adult men get mumps, it can cause orchitis, which is an inflammation of the testicles and has been associated with infertility. Rubella is normally a rather mild disease. It has been considered a typical childhood disease throughout history, but turns into a very serious disease for a pregnant woman when she becomes infected. If the virus spreads to the fetus, it can cause a spontaneous abortion and severely disturb the fetal developmental process which is known as congenital rubella syndrome (CRS). …our innate immune system (first responders) does not work with antibodies. It works mostly with something called natural killer (NK) cells and is often vitamin D dependent. Our innate immunity is the most important immune defense we have. We know that people with antibodies to specific diseases may still succumb to those diseases. We also know when you have a community-acquired infection, such as measles or mumps, it engages both sides of the immune system. The Th2 cells create the antibodies and the Th1 cells are defined by knowing the difference between you and foreign substances that are not a part of you. It is also known that certain viruses, such as the measles virus, powerfully suppress immunity. A study done in Faroe Islands showed that once somebody became sick with the measles, they stayed immune to that disease for 75 years. Those who were vaccinated against measles only had immunity lasting for about 20 years. This means if vaccinated in childhood, a woman is unlikely to pass the immunity on to her baby or at least pass it on as effectively as she would have had she contracted measles naturally. It’s essential for our immune system to develop and grow by facing natural infectious challenges. If the body is deprived of the opportunity to fight natural infections, the immune system won’t gain the required strength or knowledge to fight on its own. As a consequence, a range of hidden conditions that adversely affect your immunity may be expressed. These conditions are sometimes called Th2 dominant disorders. This happens when our immune system is not challenged by normal infections or bacteria in the environment. In the MMRII vaccine, the measles and mumps virus are propagated in chicken embryo, while Rubella virus is propagated in WI-38. After these have been propagated separately, they are then combined into one vaccine. The final product will therefore not only have all three viruses, but also chicken embryo proteins from two separate cultures and human proteins. The ProQuad vaccine has the added varicella virus, which was propagated in MRC-5 cells before being combined into one vaccine. In Japan medical authorities took the Urabe AM9 mumps vaccine and gave five million doses in a single vaccine. There were few, if any, reported cases of meningitis related to the vaccine. When they combined measles, mumps and rubella, there was a dramatic increase in the adverse reactions to the mumps virus in the vaccine, mostly in the form of meningitis. Unsurprisingly, after that scandal the Japanese authorities took the MMR vaccine off the list of recommended vaccines. Their experience was that when you combine three viruses into one, you’ve got major problems. The same thing happened in Bulgaria where they used a mumps strain called Sofia 6. The strain appeared to be triggering cases of meningitis, so it was discontinued. Three vaccines were approved in 1969 and none of them used human cells. They all used animal cells and they all eventually disappeared from the market after Plotkin’s vaccine was finally approved in 1979. The Philips-Roxanne vaccine only lasted six to nine months on the market because once it was used in a bigger population it was found to cause bad side-effects in kids, triggering very sore knees caused by inflammation. A study was done to see how much aborted fetal DNA was in the vaccines. The author studied a rubella vaccine called Meruvax II, manufactured by Merck, for ssDNA and dsDNA. The average ssDNA was 142.05 ng and the average dsDNA was 35.00 ng. If you recall early in this book we mention the FDA safety guidelines specify the amount of residual DNA should be no greater than 10 ng. Recently, information was released that the ProQuid combination vaccine by Merck resulted in twice as many seizures when the vaccines are dispensed separately. If guidelines are ignored, seizures can and do result. …Japan withdrew its home-produced MMR vaccine in 1993 after around 1,000 children suffered side-effects, in particular aseptic meningitis. The problem was pinned on the mumps component produced in Japan, which continued to vaccinate against measles and rubella using single vaccines. According to WHO data, there were 16 African countries that exceeded the United States’ vaccination rate of 91% for the measles-mumps-rubella vaccine in 2013. Besides those African countries, many other parts of the world have outperformed the US in giving infants the MMR vaccine at their one-year immunization. These include Australia, China, New Zealand and most of the European countries. In 2017, the WHO recorded that 92% of the US population received their first dose of the measles vaccine at age one. There are countries, such as China, Cuba and Thailand that achieved as much as 99% coverage dispensing first measles vaccine dosages. There is now no country in the world that offers single vaccines in preference to MMR. Therefore, the measles vaccine can be considered to be a three-in-one measles-mumps-rubella vaccine (and not just a measles vaccine). The MMR vaccine has been notoriously and infamously correlated with autism, the early childhood mental condition that is increasing so drastically the Autism Society of America considers it (autism) an epidemic. This is saying that over 90% of the blood samples in the study had antibodies from the MMR vaccine and also autoantibodies for myelin basic protein (MBP). This protein is found in the myelin sheath covering our nerves. When a person suffers from a disease that destroys the myelin sheath, MBP can be found in the blood. When you take three live viruses and inject them into a child in a way human evolution has never seen before, the game changes and all bets are off. The outcome is simply unknown. Viruses have been known to attack our nerves. An example of such a viral attack would be shingles. So, it should be of no surprise that when a variety of ingredients in a vaccine known to affect the nervous system is combined with three living viruses, they have the ability to destroy not only the nerves themselves, but also destroy their means of travel throughout the body. More on the MMR vaccine and autism in the following chapter. 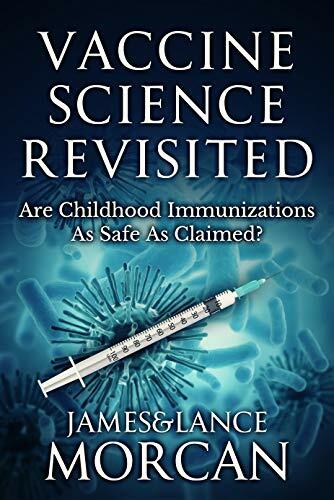 You have been reading an excerpt from VACCINE SCIENCE REVISITED: Are Childhood Immunizations As Safe As Claimed?